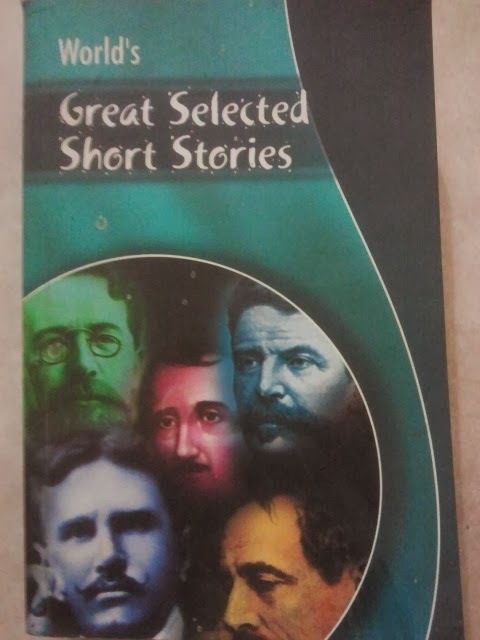 Last night I noticed this huge monster of a book on the shelf called the World's Great Selected Short Stories. I'd always thought it looked kind of dull, had never opened it and vaguely knew that it had stories by just the kind of renowned writers, whom I have only ever read in text books. But that was then - before I tried and enjoyed Shakespeare, poetry and (a few) love stories. Last night, I finally decided to read the book. The first section contained stories by H. H. Munro, better known as Saki, whom I had obviously heard a lot about, but I couldn't tell you exactly where I'd heard it all, and whom I hadn't read. I wonder why; having spent most of last night and some of today morning devouring the nineteen short stories by Saki that this book had to offer. I have overused the word 'awesome' to the point where it has little weight, but here it applies in its truest sense. The great thing about Saki's short stories is that they are really, really short. It was incredible how such a short piece could have it all: plot, evocative writing and as much attention to detail as you could possibly want without affecting the pace. A lot happened, very speedily, and at the same time, I was put right into the atmosphere with the tiniest of descriptions that were so apt they made jump in recognition. And what makes the short short stories even more special is that I won't have to take the effect away from them by giving you a summary - just click on the titles to go read them! The Background made a perfect start to the collection. I mean, who wouldn't love a story that starts with something like this? "The woman's art-jargon tired me," said Clovis to his journalist friend, "She's so fond of talking of certain pictures as 'growing on one,' as though they were a sort of fungus." What followed was the story of Henri Deplis, who has has a work of art tattooed on his back, after which the famous Italian tattoo artist dies, leaving his masterpiece still unpaid-for. Consequently, a worldwide fight ensues over its ownership, with no consideration for Henri, who just happens to be the background. Along with the first one, the stories Adrian, The Name-Day, The Phantom Luncheon and The Occasional Garden were my favourites. Each was reminiscent of all that I love about Oscar Wilde. And I don't just mean the wicked social satire, but also the wonderfully engaging dialogue and the swift pacing. By the time I got to The Music on the Hill, I had already got used to a certain style of narration, witty, mischievous, cynical. But this story was darker; more Mark Twain, maybe. The Music on the Hill was a gothic macabre story that left me feeling bitter, uneasy and awed. Along with The Name-Day, this story excelled particularly at creating the tone, bringing scenes to life, transporting me to that strange remote setting, conveying in so few words exactly what the characters felt. That aura made me see the rest of the stories differently - the became my Lovecraft-Poe-obsessed kind of reads! The next story to really hit me hard was The Open Window. I found it difficult to wrap my head around how even the weirder of the stories stayed perfectly true to human nature. This short scene was absurd, haunting, hilarious and evil all at the same time and I have to say, I quite liked the niece. I'm pretty sure if I forced my sister to read this story (which I will) she'll say I am like the niece. Jokes apart, nothing I say about this story is going to suffice. Just read it already! Judkin of the Parcels was a little piece, not as much a story as an elaborate character sketch, or really, a life sketch, and a delicate and wise one at that. It was in Laura, the eighteenth of the nineteen stories, that the disturbing dark humour returned in the form of a delightful tale of karma and reincarnation. I realized then just how ridiculously amusing and charming the writing was. It occurred to me that having read these stories, I would probably never find any short stories and just stories up to par. But this was just the beginning of Saki for me. Stumbling into nineteen stories is hardly anything! I still have a lot to dig through and a lot to re-read and analyse and look up and the thought of what's out there waiting for me makes me very happy. If you are one of those people, like me, crazy enough to not have read this great author, please, I hope my raving has made you want to. And it's easy, just click to read! What a great site that is, thank you for pointing it out! I did read the first one and will continue with the others when time allows. Priya - Saki is one of my favourite writers in all the world. I have his entire collection and read and reread and read again. All are delightful. My favourite is The Schartz Metterklume Method. Have attached a link where this and all Saki stories are available. Enjoy! Hi Naheed, welcome to my blog. Thanks so much for the link. After the nineteen stories, Saki's one of my favourite writers too - I'll be glued to this website now! !